It's more than just an escape room or breakout, more than a color by number activity or a cootie-catcher. You have just found a rare combination of all of these activities -- a unique Christmas-themed team-building journey for your students that requires almost no prep from you! And there's a prize at the end of the activity! 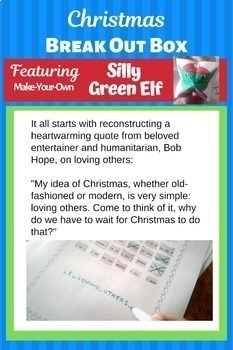 It all starts with reconstructing an inspirational quote about loving others from beloved entertainer and humanitarian, Bob Hope: "My idea of Christmas, whether old-fashioned or modern, is very simple: loving others. Come to think of it, why do we have to wait for Christmas to do that?" Next, Aunt Amy has come to visit for the winter break. She's very particular about what she likes and doesn't like, but everything she likes has something in common. Can your students figure out the rule, so everybody can have a happy Christmas? The journey continues on to an enjoyable crossword search puzzle worksheet -- students solve crossword-style clues to find the answers in a word search grid. There's a funny Christmas riddle to solve that will make even the most sophisticated 8th graders laugh (actually, it's perfect for students in grades 6-11). And finally, there's the prize -- the lovely, lovely prize. 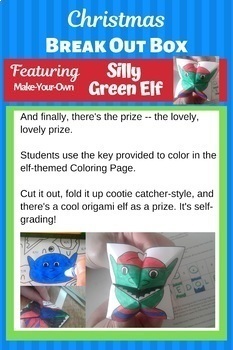 Based on their answers to the other puzzles, students use the key provided to color in the elf-themed Coloring Page. 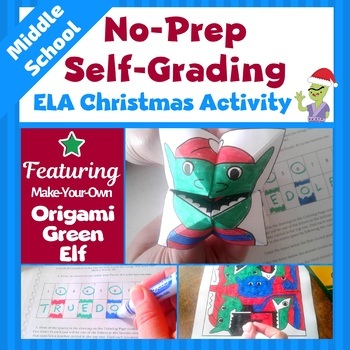 Cut it out, fold it up cootie catcher-style (instructions with diagrams provided), and there's a cool origami green elf as a prize. It's self-grading! 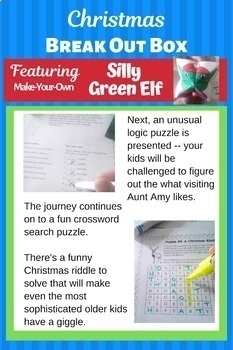 If the students did not solve the other puzzles correctly, the coloring of the elf will be clearly incorrect. And it's not obvious beforehand how to color the elf - it may LOOK obvious, but it is not! Teaches vocabulary, ELA, lateral thinking, and perseverance.